Charlie: Farro is more like barley. It takes 30 minutes or so to cook, and the grains become chewy. Well-balanced flavorwise and nutritially speaking. This recipe is great and your dish must taste wonderful. Love it- very clever rendition on a burger with ketchup! That chutney sounds wonderful- like it would be the heck out of ketchup any day. 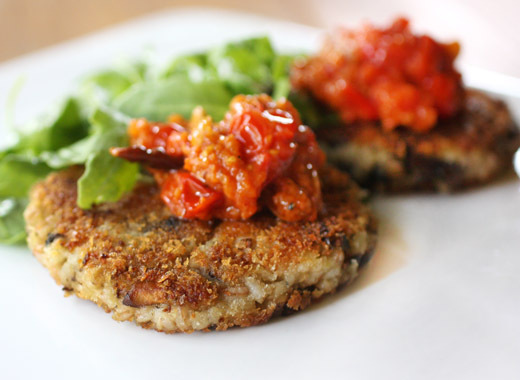 These are some healthy and flavourful burgers. Great Burgers, Lisa! Recently I've been "playing" with farro however, I had no idea it froze well. Good to know!!! The "star" of this meal may just be that tomato chutney. Very cool!!!! Lisa I love this recipe! 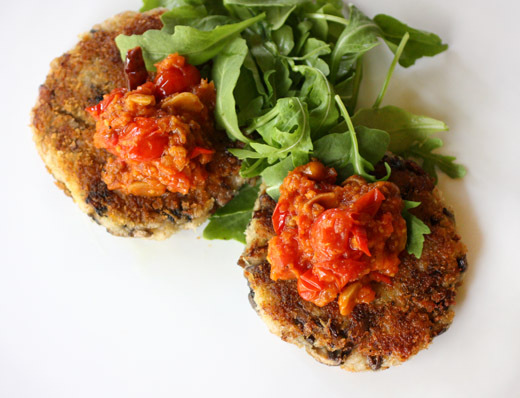 I use farro for many things, but I've never made a veggie burger with it. Brilliant post. This looks great! I like that it's kind of a fall spin on a veggie burger, with the mushrooms and farro, so we can enjoy this fabulous fall weather we're having by grilling outside! Great looking burgers. 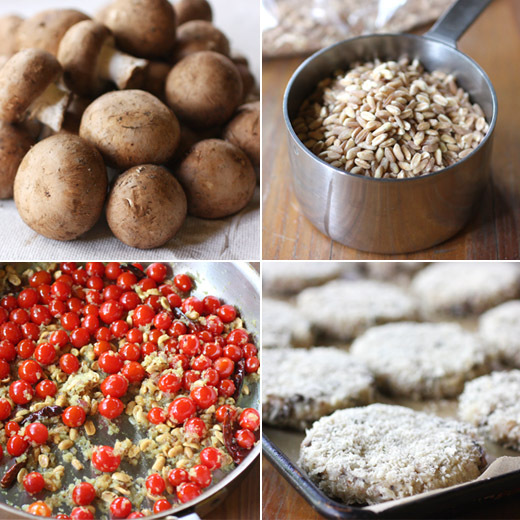 Love the idea of turning mushrooms and farro into burgers - the flavor must be awesome. And it makes sense that they wouldn't hold their shape if you needed to flip them whilst grilling. Nice post - thanks. Love mushrooms and making them with farro is such a healthy option. Lisa this recipe is extremely delicious!!!! A sublime vegetarian dinner! Terrific flavors that are so satisfying without the addition of meat in a main dish. The addition of homemade chutney is just heady! Still haven't cooked with farro myself, really has to change because this looks great! What a wonderfully flavorful and balanced vegetarian dish. This is a beautifully healthy lunchtime meal for those who care about eating healthfully and well. Your touch on serving them without buns is perfect for my taste. I think they are too delicate to go inside bread, and you get more of their flavor on their own. i'm a huge fan of the concept of chutneys, and this one sounds terrific! I also NEVER eat the buns, so would serve them exactly as you did. The chutney sounds marvelous. Well, the burgers caught my attention first, but now I'm intrigued by the chutney. Every bit of it sounds so good! I was just discussing farro with someone and we wanted to figure out ways to use it more. These burgers are perfect! Love mushrooms and I love the crispy coating you've got going here. The chutney is wonderful! A wonderfully creative recipe! Very much looking forward to trying these out myself! The tomato onion peanut chutney sounds terrific. I'll save this recipe for next years tomato harvest.